You can save your tables inside SuperWEB2. Once saved, the table definitions will be available again the next time you log in to SuperWEB2. 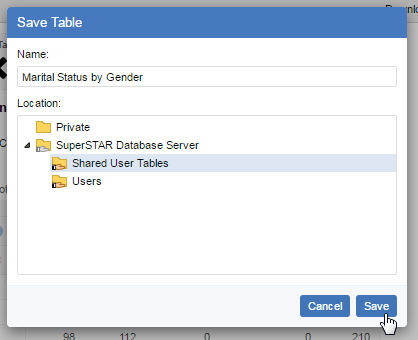 Tables saved by users in SuperWEB2 are typically private (only visible and accessible to the user who created the table). Depending on how your administrator has configured SuperWEB2, you may also be able to load and save shared tables, which are accessible to multiple SuperWEB2 users. If you are logged in as a guest user, you will not be able to save tables. Choose the Private folder to save a table that is accessible to you only (this option is always available to logged in users). Choose any of the shared folders (indicated by the shared folder symbol, ) to save a table that will be accessible to other SuperWEB2 users. You will only be able to save to a shared folder if your administrator has given you permissions to save to that folder. The folder permissions will also determine which other SuperWEB2 users will be able to access the folder. Check with your administrator to confirm how permissions have been set up in your SuperWEB2 deployment. The name of the table must be less than 255 characters long. 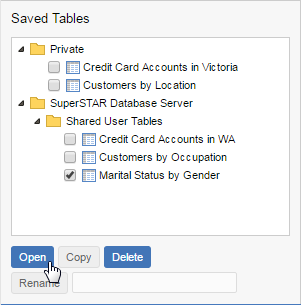 When you save tables to the Private folder, they must have a unique name; tables saved to a shared folder can have the same name as an existing saved shared table. Your administrator may have configured a limit on the maximum number of private saved tables you can have at any one time. If you have exceeded this limit you will not be able to save any more private tables until you go to Manage Tables and delete some of your existing saved private tables. Please note that this limit does not apply to shared tables. 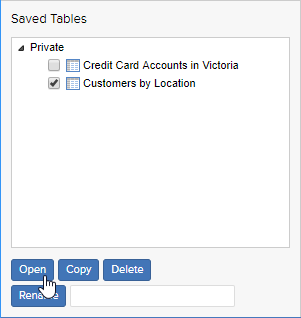 You can reload saved tables one of three ways: from Table View, from Manage Tables and from Datasets. SuperWEB2 displays a list of all the saved tables you have access to for this dataset. Double-click a table to open it, or click once to select and click Open Table. Select the table you want to reopen. If you currently have a table open, then SuperWEB2 displays a message warning you that any unsaved table content will be lost (this means that the selected table will replace the currently active table). Click OK. Select the check box next to the table you want to rename. Enter a new name in the text box. Select the check box next to the table you want to copy. Select the check box next to the table or tables you want to delete. Click OK to confirm you want to delete the table or tables. Make sure you check that you are deleting the correct table or tables, as there is no way to undo the deletion. Your administrator may have configured a limit on the number of saved tables you can have at any one time. You should delete any unused tables so you have enough space to continue saving your customised tables. 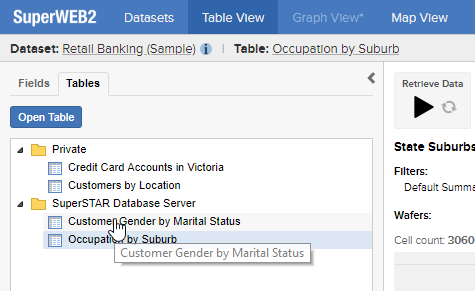 Depending on how your administrator has configured SuperWEB2, you may be able to change the order that tables are listed in the Saved Tables tab. Choose between Alphabetical (tables will be displayed in ascending alphabetical order) or Last Modified (the most recently modified/created tables will appear at the top of the list). If you do not see this option, then this means that your administrator has turned off the ability to set this preference. Your saved tables will be displayed in the order set by your administrator (by default, this is alphabetical order). See Large Tables - SuperWEB2 for more information about using SuperWEB2 in large table mode.